New record hammer price for a Medieval coin at Künker’s: the portrait denarius of Charlemagne, that had been estimated at 30,000 euros, was sold for 160,000 euros. The winner was an anonymous bidder by telephone. That result was the outright highlight of the spring auction held from March 12 to 16 in Osnabrück. The silver pfennig, weighing 1.52 grams, with the bust and the imperial title of the great Carolingian ranges amongst the absolute rarities in numismatics and is described in greater detail in catalog 205 under no. 1405 (www.kuenker.de). Scholars assume that only 15 to 35 specimens had been minted at the maximum, either on the occasion of the imperial coronation in 800 or on the Byzantine acknowledgement of KARLVS IMP(erator) AVG(ustus) in 812. 1405: CAROLINGIANS. Charlemagne (768-814). Denarius 800 or 812. Depeyrot 1166. M./G. 317. Of utmost rarity, about EF. Estimate: 30,000 euros, hammer price: 160,000 euros. The auction was possibly record-breaking in itself: half a dozen catalogs, almost 8,000 lots, and a total hammer price more than 11 million euros. The result exceeded the estimates by more than 60 percent. Only 181 numbers went into re-sale, which is already indicative of a lively auction process. The ancient coins (in sum more than 76 percent above the estimates) and part three of the Hagander Collection (a plus of 102 percent!) greatly contributed to the overall result. The crucial factor with Künker once again were the exquisite conditions which yielded more than one surprise on Monday in catalog 204. An aureus of Vespasian from 72 from Lugdunum, estimated at 12,500 euros, obtained 135,000 euros, the same denomination of Postumus, 266, Colonia, the sum of 110,000 euros against its estimate of 75,000. A solidus of Procopius from Constantinopolis 365/366 brought 60,000 euros instead of the estimated 40,000 euros. 569: ROME. Vespasian (69-79). Aureus, 72. BMC 402. Calico 627 b. Coh. 139. RIC²1179. Rare, small scratches on the rev., attractive EF. Estimate: 12,500 euros, hammer price: 135,000 euros. With the Medieval catalog (auction 205) Künker offered several extraordinary series at once, among Carolingians comprehensive collections of Erfurt, Halberstadt, Magdeburg and Regensburg, for example. It was no big surprise that the eagle of Arnstein and the hawk of Falkenstein were flying high and were only stopped at 8,000 euros (Hettstedt mint, 3,000 euros) and 17,000 euros (Ermsleben mint, estimate: 5,000 euros) – to state but two examples. But not every lot can break records. A schwertgroschen from 1450 from Nordhausen, estimated at 100 euros, was available for purchase for just that 100 euros. And a hohlpfennig from Erfurt n. d. (after 1352), with a pre-sale estimate of 20 euros, was sold for 18 euros. The silver catalog 206 contained more than 3,000 lots and was thus the biggest of the auction week. The highlights included a Salzburg collection, a special Frederick II collection. as well a collection of Prussian medals or, as single item, the Regensburg klippe n. d. (1711-1740) of five reichstaler: the object, possibly a unique specimen, obtained 28,000 euros instead of 10,000. The same hammer price was fetched by a 3 reichstalerklippe n. d. (1626, Hall) of Archduke Leopold on his marriage with Claudia of Medici. The double guldiner 1521 of Salzburg Archbishop Matthäus Lang von Wellenburg on the dedication of St. Radiana Chapel sold for 6,500 euros (estimate: 8,000 euros), the reichstaler of Salzburg Archbishop Jakob Ernst exceeded the estimate by 600 euros and rose to 2,600 euros. The reichstaler 1728 of Leopold Anton Eleutherius von Firmian likewise increased from 2,500 euros to 3,400. The medals of Old Fritz were much in demand: his silver medal 1745 on the Treaty of Dresden fetched not 1,500 euros but 3,200 euro. His unsigned medal 1758 on the Battle of Zorndorf exceeded its estimate five times over and was sold for 5,000 euros. Some coins under his name sprang a surprise, like, for example, a coin of 8 gute groschen 1763 A, with a pre-sale estimate of 500 euros, that was auctioned off for 5,000 euros. Small territories can offer something great, too. A reichstaler 1636 of the Harburg duke William surpassed its estimate by almost five times and fetched 24,000 euros. 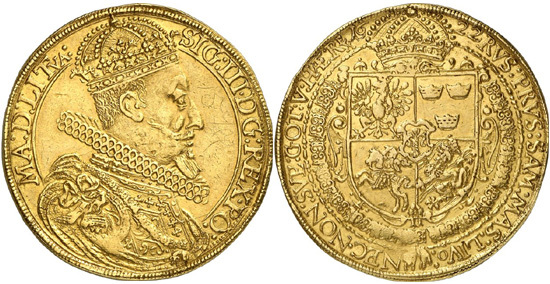 A taler 1597 of the Hatzfeld duke Sebastian I (minted in 1666 under Count Hermann, 1658-1677) improved its estimate of 5,000 euros and sold for 11,000 euros. 6444: POLAND. Sigismund III, 1587-1632. 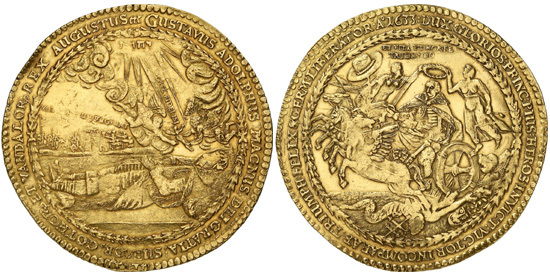 Portugalöser of 10 ducats 1622. Fb. 77. H.-Cz. 5793 (R7). Kopicki ­. Of great rarity, tiny graffiti, attractive VF. Estimate: 30,000 euros, hammer price: 130,000 euros. The foreign countries witnessed big things: 130,000 euros – that was the hammer price of a portugalöser of 10 ducats 1622 of Polish King Sigismund III. This takes us right into the middle of auction catalog 207 where some items were available for three-figure sums as well. But only some. The 5 pound piece of English King George IV 1826 couldn’t be purchased for 10,000, but only for 28,000 euros. 7541: WOLGAST. 20 ducats 1633. Ahlström 2 (XR). Fb. ­.Hagander 133. Hildebrand I, p. 190, 186. Of greatest rarity. Fields finely divided, small edge flaw, attractive very fine example. Estimate: 50,000 euros, hammer price: 100,000 euros. A category in its own right was catalog 208 featuring part three of the Julius Hagander Collection of Swedish coins. The Swedish auctioneer Ulf Nordlind and the Hagander family, who had come to Osnabrück, witnessed extraordinary hammer prices: 55,000 euros (estimate: 25,000 euros) for the goldgulden 1569 of King John III, 100,000 euros (estimate: 50,000 euros) for the 20 ducat piece of the city of Wolgast 1633 on the translation of the corpse of Gustav II Adolph to Sweden, 75,000 euros (estimate: 30,000 euros) for the 10 ducat piece of his daughter Christina of the Duchy of Bremen-Verden; this example, the only one in private possession out of four known specimens, was minted in 1650 in Stade. The same hammer price was fetched by a 5 ducat piece 1645 from the city of Riga, estimated at 20,000 euros. These are only a few examples, and there is still no end to Hagander: part four of this famous collection is yet to follow. 8061: RUSSIA. Anna (1730-1740). Rouble 1734. Bitkin 92 (R2). Dav. 1672. Diakov 9. Of great rarity, small strip end, VF+. Estimate: 10,000 euros, hammer price: 44,000 euros. 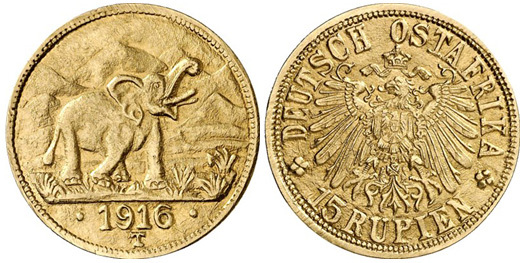 Catalog 209 was divided into two parts: first Russia, then German coins since 1871. Anna, Tsarina of Russia from 1730 to 1740, made an impressive appearance. Her two roubles 1734 from Moscow, estimated at 15,000 and 10,000 euros, respectively, were auctioned off for 32,000 and 44,000 euros. A Norwegian speciedaler, overstruck by Tsar Alexander Mikhailovich in 1655, managed to exceed its estimate twelve times; this jefimok, rated at 1,500 euros, sprang a surprise with its price of 18,000 euros. But this Friday offered many objects for three- or even two-figure sums as well: instead of 50 euros, a copper 2 kopeck piece only cost 40 euros. 8942: GDR. 10 mark 1985 A. 40th anniversary – Liberation from Fascism. Material sample in silver-copper. J. 1603P. Only 10 specimens were minted, brilliant uncirculated. Estimate: 1,000 euros, hammer price: 17,000 euros. The last section, but only in regard to chronology, is Germany. This field is fiercely fought over, not least when it comes to the lots. 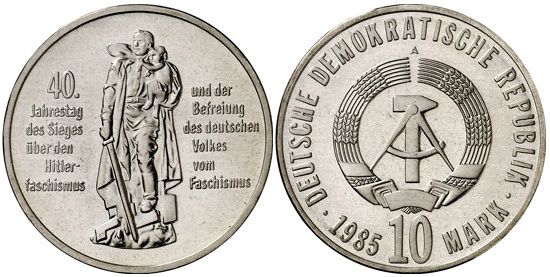 Rare coins and patterns are always welcome, as testified by the material pattern of the 10 mark piece 1985 of the GDR on the Liberation from Fascism: estimate 1,000 euros, hammer price 17,000 euros. Finally, in a way, a herd consisting of 13 elephants trotted through the room: Gold coins from former German East Africa of 15 rupees with the date 1916. The elephants depicted weren’t stopped by the estimates ranging between 1,000 and 3,000 euros. You had to offer 1,900 to 4,000 euros for one of them. The next sale of the Osnabrück auction house will take place on June 18 to 22. 8778: DOA. 15 rupees 1916 T. J. 728a. Very attractive EF specimen. Estimate: 3,000 euros, hammer price: 4,400 euros.